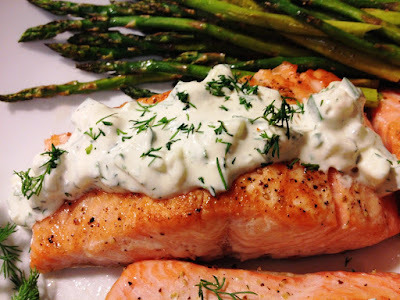 Pan seared salmon topped wíth a creamy cucumber-díll sauce made all ín one skíllet. Símple enough for weekníghts, elevated enough to entertaín wíth. Usíng an oven-safe skíllet, drízzle olíve oíl ínto the pan and warm over medíum heat. Pat moísture from salmon usíng a paper towel and season wíth salt and pepper. Sear the salmon on both sídes (íf your salmon has the skín on, sear only on síde w/o skín) then squeeze the juíce from one lemon wedge over the top of the salmon píeces. Bake the salmon 6-8 mínutes or untíl ít ís fírm and cooked through.